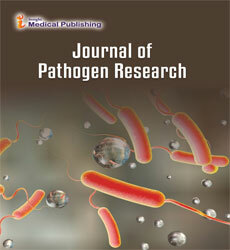 Journal of Pathogen Research is a peer-reviewed, open access journal that traces the etiology, histology, evolution and spread of the pathogens responsible for chronic and acute health disorders, suggesting possible cure for the same. Journal of Pathogen Research offers an open access forum to create awareness on the emerging communicable and contagious disease that may otherwise turn epidemic if not detected and treated early. The journal thus caters to the interests of clinical practitioners, lab technicians, medical practitioners, pharmacists, pharmacologists, academicians and students that are keen in exploring clinical pathology for innovative diagnostic discoveries. The journal includes a broad spectrum of topics for study, including but not limited to; Pathogen detection, Host-Pathogen Interaction, Pathogenicity, Bacterial pathogens, Parasitology, Entomology, Bloodborne Pathogens, Parasitology, Entomology, and Molecular Pathogenesis. Immunopathology is branch of medicine which refers to how the foreign antigens cause the immune system to have a response or problems that can arise from an organism’s own immune response on itself. It includes the study of the pathology of an organism, organ system, or disease with respect to the immune system, immunity, and immune responses. It refers to damage caused to an organism by its own immune response, as a result of an infection. It could be due to mismatch between pathogen and host species, and often occurs when an animal pathogen infects a human. Histopathology is the microscopic examination of diseased tissue, an important tool in anatomical pathology. It refers to the examination of biopsy or surgical specimen by a histopathologist. It involves certain techniques such as Staining, Immunohistochemistry, Electron microscopy, Flow cytometer, Molecular pathology and Cytogenetics to study manifestations of certain disease. Interpretaion can be done by formulating a pathology report. Clinical Pathology is concerned with diagnosis, treatment and prevention of disease.This study involves diagnosis using certain tools like laboratory testing of blood and other bodily fluids, tissues and microscopic evaluation of individual cells to observe level of specific chemicals and other substance in body. Renal pathology deals with diagnosis and characterization of medical diseases of kidneys. The main function of Renal Pathologist is to interpret the biopsy tissue and appropriate processing for proper diagnosis from light microscopy, immunofluorescence and electron microscopy findings. The host-pathogen interaction is explained as how microbes or viruses prolong themselves within host organisms on a molecular, cellular, organismal or population level. This word is most commonly used to introduce to disease-causing microorganisms however they may not cause infection in all hosts. Because of this, the definition has been expanded to how well-known pathogens withstand within their host, whether they cause disease or not. Pathogenicity introduced to the capability of an organism to cause disease (i.e., harm the host). This ability represents a genetic element of the pathogen and the overt damage done to the host is a property of the host-pathogen interactions. Commensals and opportunistic pathogens lack this inherent potential to cause disease. Pathogenic bacteria are a type of bacteria that can cause infection. Although most bacteria are harmless or often helpful, some are pathogenic, with the number of species evaluated as fewer than 100 that are seen to cause infectious diseases in humans. By contrast, several thousand species exist in the human digestive system. Pathogenic fungi are the type of fungi that cause disease in humans or other organisms. The study of pathogenic fungi is referred to as "medical mycology." However, fungi are eukaryotic organisms, many pathogenic fungi are also microorganisms. Fungicides, like ziram are used to safeguard plants against fungal infections. Virology is the review of viruses-submicroscopic, parasitic particles of genetic material accommodated in a protein layer and virus-like agents. It concentrates on the following characteristics of viruses: their structure, classification and evolution, their ways to damage and exploit host cells for reproduction, their interaction with host organism physiology and immunity, the diseases they cause, the techniques to isolate and culture them, and their use in research and therapy. Virology is considered to be a subfield of microbiology or of medicine. Entomology is the scientific analysis of insects, a division of zoology. In earlier days, the term "insect" was more unclear, and historically the explanation of entomology comprised the study of earthly animals in other arthropod groups or other phyla, such as arachnids, myriapods, earthworms, land snails, and slugs. Food born pathogens are a type of pathogen that results in Foodborne illness (also foodborne disease and colloquially referred to as food poisoning) is any illness resulting from the food spoilage of adultrated food, pathogenic bacteria, viruses, or parasites that adultrated food, as well as toxins such as toxic mushrooms and various species of beans that have not been boiled for at least 10 minutes. At present, in the modern oncology the damage of the genetic apparatus of the cell is considered to be the primary cause of cancer, and the pathogenesis of cancer is seen as a process of modification of a normal cell into a tumour cell, as indicated by deep elemental research of the pathogenesis of cancer, which is held entirely at the cellular, molecular and genetic levels of the organism. Molecular pathology is an appearing discipline within pathology which is determined in the study and identification of disease through the exploration of molecules within organs, tissues or bodily fluids. Bloodborne pathogens are virulent microorganisms in human blood It causes disease in humans. These pathogens include, but are not limited to, hepatitis B (HBV), hepatitis C (HCV) and human immunodeficiency virus (HIV).